We love hearing from our clients! Thank you to Wendy, who took the time to write us a 5 Star review on Yelp and send us these beautiful pictures of her wearing her ring! “My journey for finding the perfect diamond began a little over a year ago. My sweet husband wanted to upgrade my wedding ring and let me be in 100% control of the choosing process to ensure I get exactly what my heart desired. I knew I wanted to travel to NYC and visit the Diamond District but that street can be pretty overwhelming if you’re just walking in to look and not knowing if the person you’re speaking to is one to trust with such a very important, valuable purchase. I decided to extensively research online in hopes of finding the right match and that’s when I came across Keith Saxe and his phenomenal reviews. Upon reading what many people had to say, I felt compelled to contact him and he did not disappoint! He was very attentive in listening to what exactly I was looking for and was very informative and genuinely interested in helping me obtain my goal. Fast forward to a year later and we were finally able to make the trip to NYC and to finally meet Keith in person. He was very professional, informative, not pushy at all, kind and generally a great human being who truly cared about us and what we were looking for. 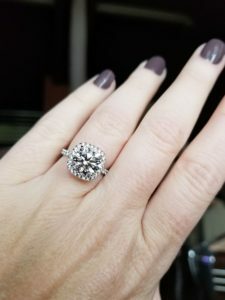 He gave us multiple choices to look at and explained in great detail the qualities of each diamond and which one he felt in his professional opinion checked all my boxes within my budget. 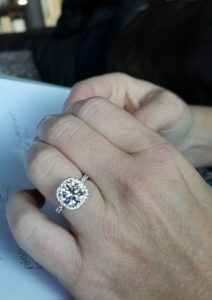 It was the perfect diamond for me at a great price!! Next came the setting in which I was very specific about as well and Keith and his team custom made it to my exact specifications and it turned out better than I could have imagined. I received my ring yesterday and saw it all together for the first time and needless to say I’m over the moon excited and couldn’t be more thankful to Keith and his team for such an awesome, meaningful experience! 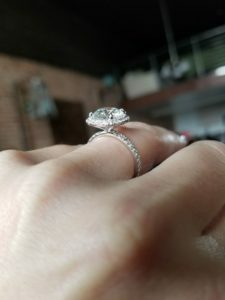 I would highly recommend Keith to anyone looking for jewelry and his access to beautiful stones and his knowledge and expertise are truly something to trust.